A nursing salon for your health! Health is wealth! 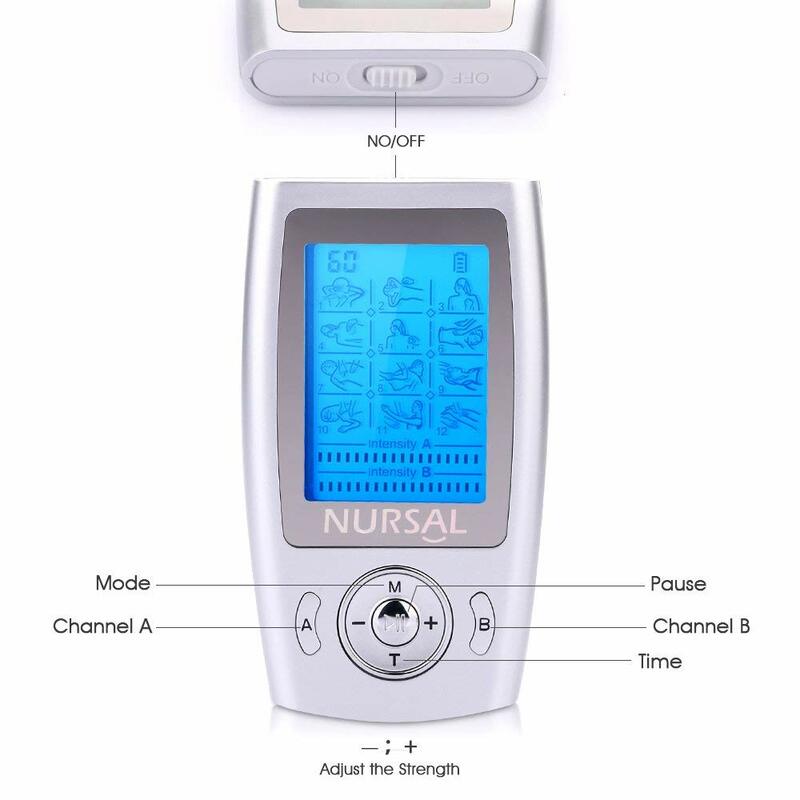 NURSAL TENS machine aims to revitalize your body with the best nursing relax salon. Promotes optimum health thus allowing you to live a comfortable life without pain. -A pause button (center button) you can click in the case of an emergency. It is recommended to use this button when removing\relocating the electrode pads. 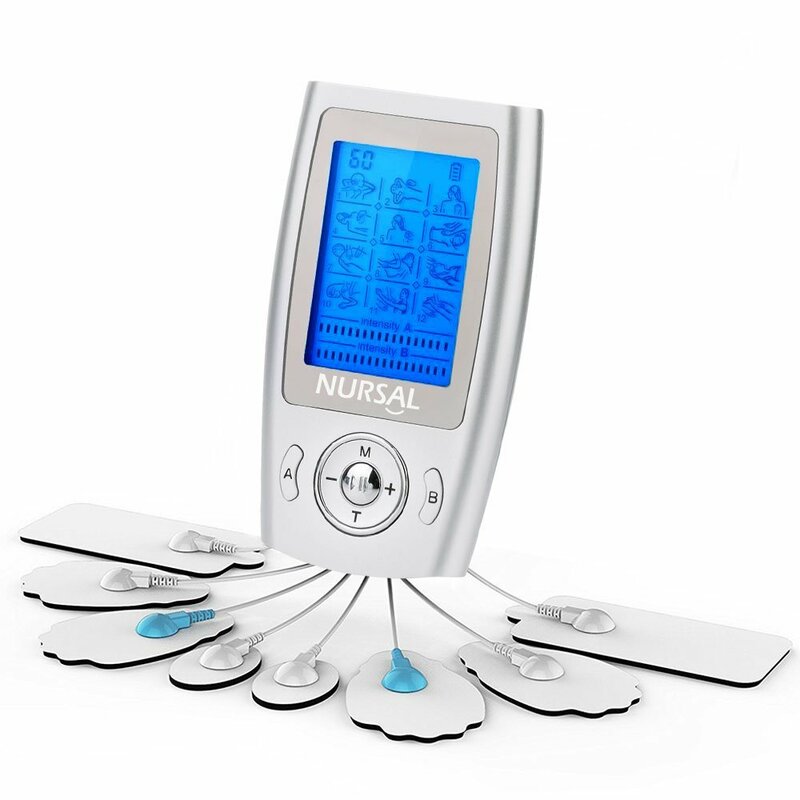 User-friendly interface makes this product the most powerful weapon in your fight against chronic pain. Extremely effective for every unthinkable ache and pain located at almost any part of your body. Use it on your wrists, hands, shoulders, elbows / joints, back, shoulders, calves, knees and so on. 1. 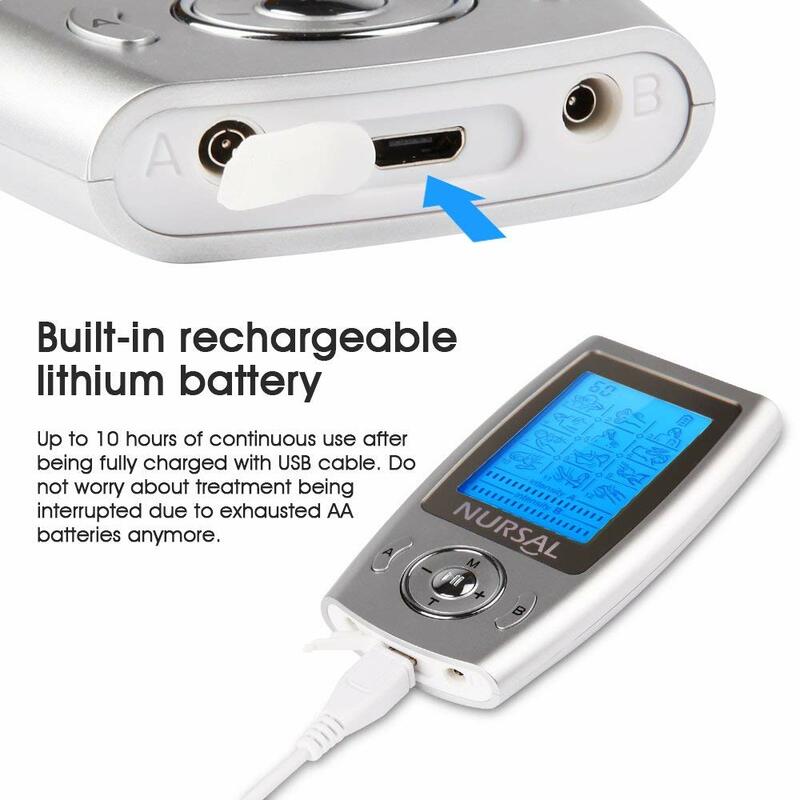 This item is USB chargeable. There is no adapter for this unit. 2. 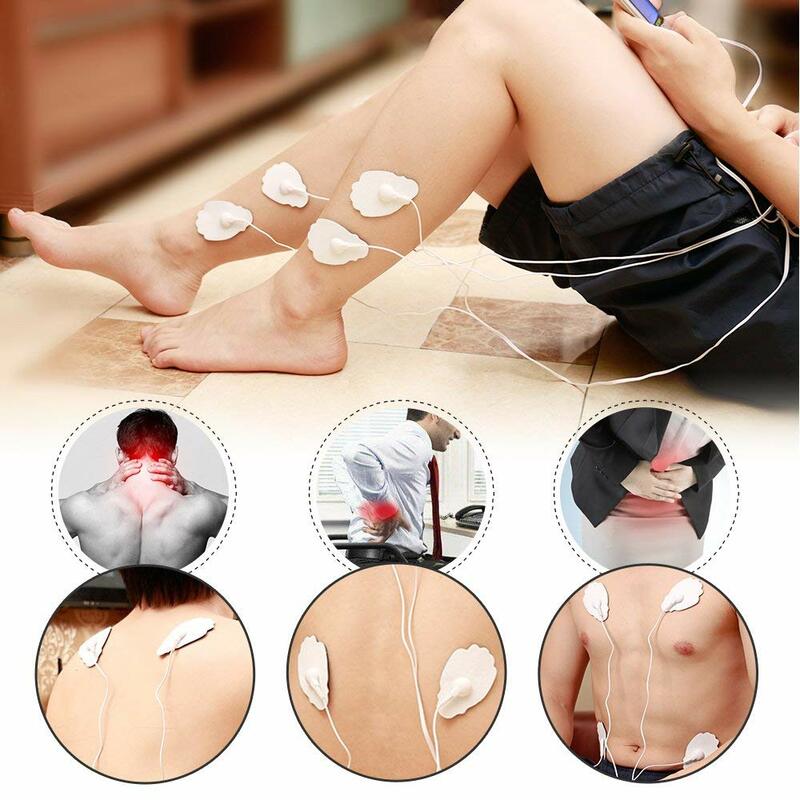 Please place the electrode pads onto your skin firstly before you adjust the intensity. Question: How can you properly take care of the pads? water rub gently with fingers then air dry. Mine are still good after at least 50 uses. Question: Can you use this on your neck? Answer: Yes. I had neck and upper back pain. It helps ease the pain. Question: What batteries does this use? Question: Can this work on both 110-220 volts? Answer: It does not come with charger but you can us any cell phone charger so if you have a cell phone charger that works on 110 or 220, then you can recharge it easily. Most cell phone charges work on 110 and 220. Question: I saw one unit with a timer that could be set for an hour and go off if you fell asleep. Do you know which one it was? Answer: This unit can be preset for up to 60 min. In 10-second increments (10, 20, 30, etc. ), and will switch itself off after the programmed time. (That’s basically a sleep timer.) 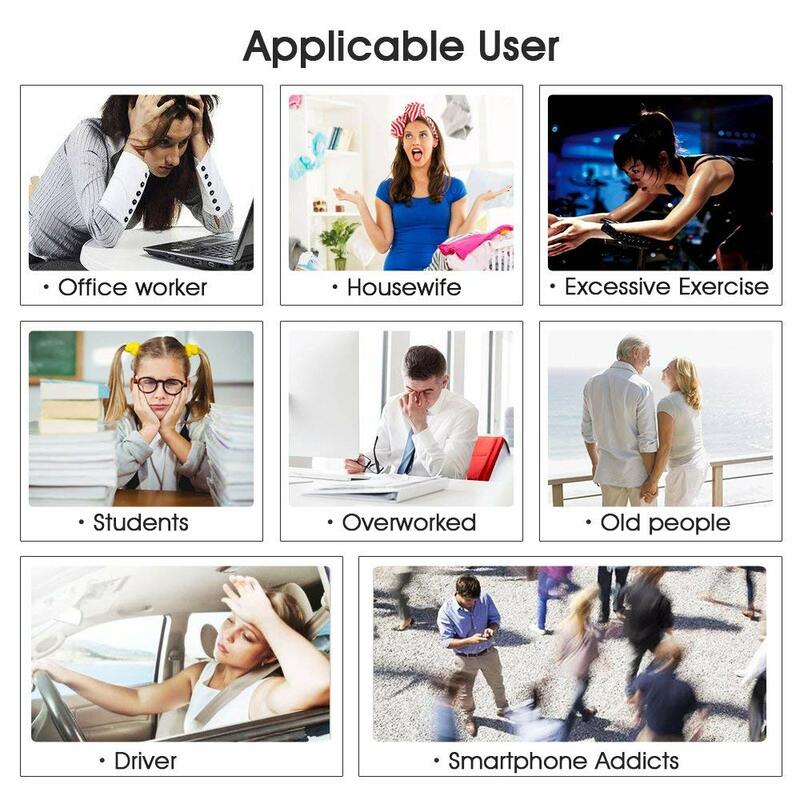 it can’t run longer than an hour without being reset by the user, so it’s fail-safe. Question: can someone tell me what all the settings are? Does it have “muscle fatigue” setting? Answer: The “A” or “B” must be pushed depending on which port you have plugged the wire into. The “M” selects the mode or massage you need, you need to go through each one and look at the picture for the way the massage will go. I tried each one. To try them you push the plus sign, then go to next mode”M” and start pushing the plus until you can feel the massage. If the massage gets to strong just push the minus and get it comfortable. Finally, the “T” is the longevity is controlled with this. It will increase in 20 min. increments. I hope this helps you. I love my tens machine! Question: What are the dimensions of the unit? Answer: Fits in the palm of your hand, about 3.5″ x 1.75″. Question: Does anyone know how to get more electrode pads? They work great with my tens unit. Question: How can this device used as a Ems? Question: is this unit wireless and have a remote. Thanks. Question: What’s the deal with the no warranty…? Answer: Thanks for your question. We support 1-year warranty. If you have any other problems about this item, Please contact our costumer service via Amazon Messenger. Can’t remember life without it. I have a lot of neck issues and this is a godsend when the muscles are pinching and bunching up or if you have a muscle cramp you can’t work out. Works very well bring relief for pain in upper arm. Would recommend to anyone who got relief during PT Tens treatment. Works the same as the much larger unit PT had. My physical therapist recommended this machine and it works great. Does exactly what I need for my muscles. Really helped with my knee injury recovery. Made my knee more mobile. Highly recommend if you’re experiencing joint/ muscle stiffness / pain. It is really more powerful than I expected. I have not charged it since I got it. 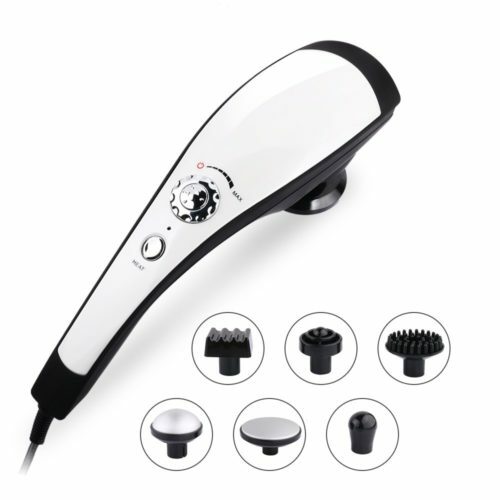 I cannot use it on full power, so I am glad that I can use the different modes and power level to give me relief. Works really well on my lower back. I would highly recommend this product to everyone. Pain relief after rotator cuff surgery. It’s almost as good as actually going to physical therapy. I’m happy I have the something that I can use anytime I need too. Driving, walking or just sitting it’s wonderful. 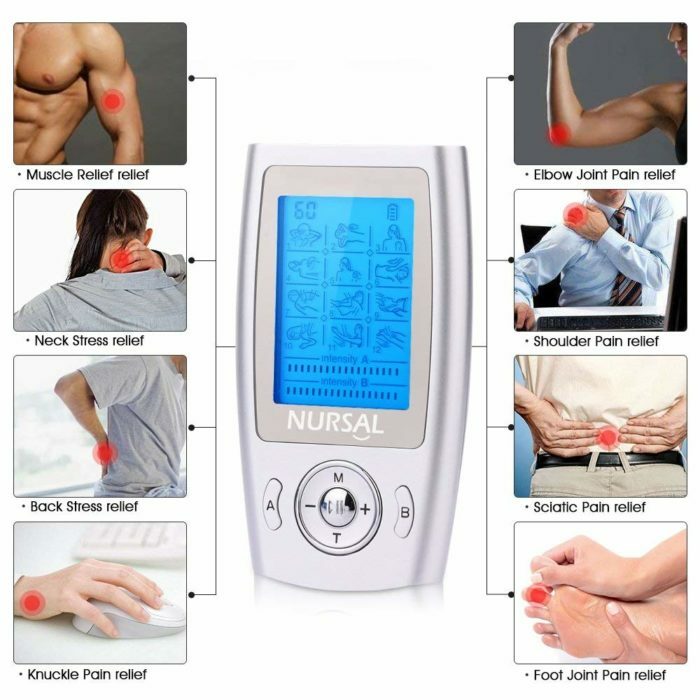 Best pain relieving machine with pads. My first day using the machine I felt instant relief. I highly recommend anyone who suffers from constant pain or arthritis to order this product from Amazon. It’s worth the investment into healthy mobility. I honestly wasn’t expecting this little device to deliver such a strong or effective current. I’ve owned a medical grade stem device for fifteen years and have used it regularly for cervical neck pain. 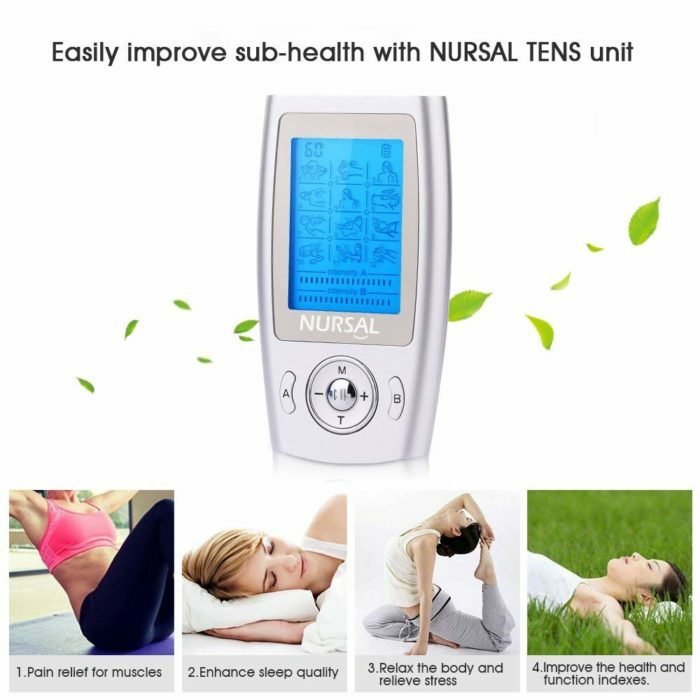 I have three levels fused and have dealt with chronic neck pain for Over 25 years so I’ve experienced many different tens and pain relief devices. I am thrilled to be able to recommend this little unit as a great way to deal with chronic neck and shoulder pain. I just put on 2 or 4 pads and set the pattern and intensity I want to use for my current need and let it go. It’s great for taking with you on the go thanks to its small, lightweight design. A great addition to my pain management toolkit. This is the best Tens Unit I have ever bought. It actually works and feels better than the ones my chiropractor uses. It really helped me when my low back went out. After a few days of using, I had incredible improvement! I highly recommend. This little machine is awesome! Great functionality for the price. The 2 channel intensity is pretty awesome too. I get bad sciatic pain and this is a more effective solution for me than any pills or exercises. Just get it, you won’t be disappointed! 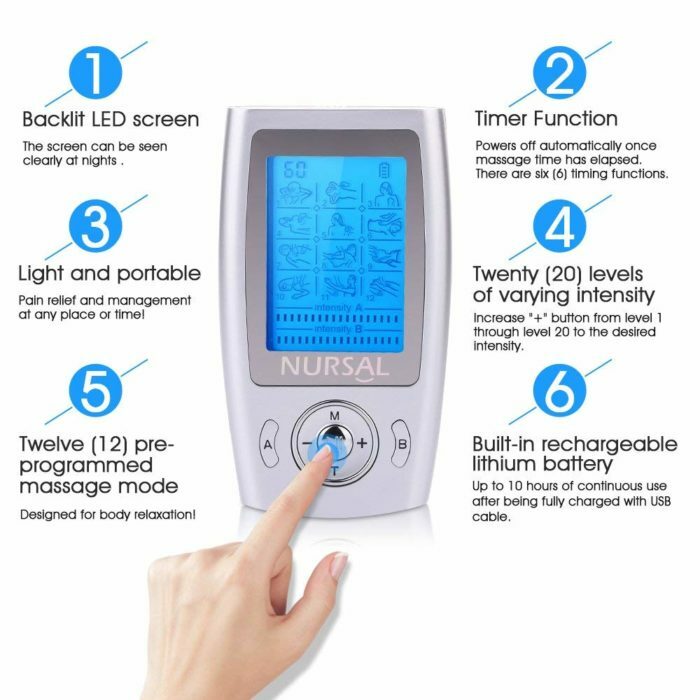 The product came in a sturdy hard box,well sealed.The machine is made of light aluminum material with accessible controls.The screen is adequately lit with a blue color and has very readable icons. The intensity of the transmission current is controllable and gives a good relaxing massage. I enjoyed using this machine every after gym workouts and after my 12 hour shifts in the hospital. The battery life is also long.I’m very happy with this purchase! Love this, we both use it a lot, very compact and easy to use. This model has quite a few settings, which makes it nice for different needs. I highly recommend this to anyone needing a quality unit. Works great! My husband has severe back pain and this has helped him a lot! The device really helped with my hip and knee pain. I purchased this as I had broken the display on my other Nursal unit. It works exactly as it should. Its fantastic. It’s a powerful little machine that really is beyond anything I expected. It has helped me immensely and I talk about it all the time and recommend it highly. It truly works! 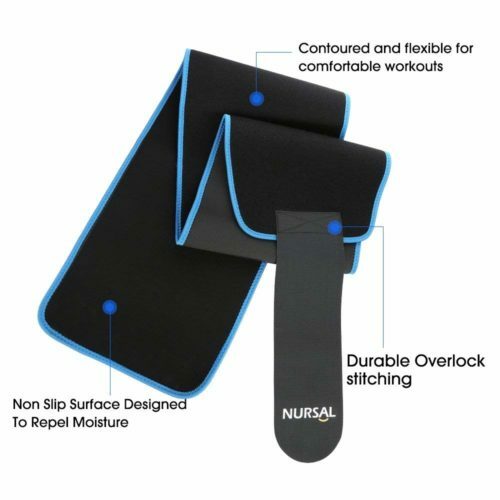 From time to time I get muscle soreness due to age, the very first time I used the Nursal I was amazed at how it helped. I travel quite frequently and never leave home without it. I’ve purchase a similar product the was substantially more expensive, the NURSAL muscle stimulator is equally as good at a quarter of the price. good product, Great value! Tight neck muscles. I am not in as much pain. 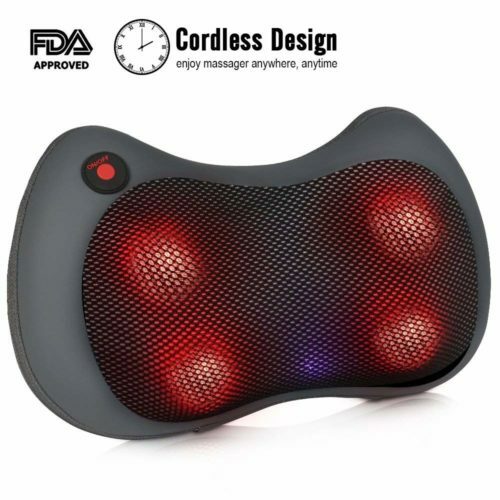 Product is helping me release the tension in my neck. So easy to use… it works! This helps with my lower back pain as I’m on my feet all day. I’ve only had it a short time (about a month), but it is easy to use and seems to work well. 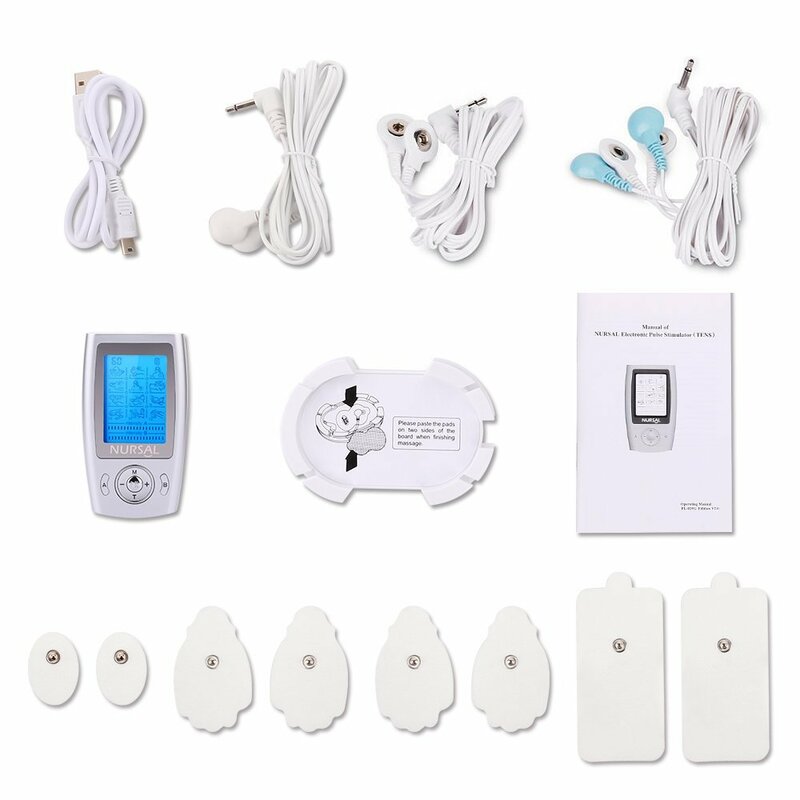 Tens units are like a massage without the massage touch. This unit’s battery is amazing. I use this daily for about an hour daily while I relax in the evenings. Ive used the large pads for 3 weeks now after softball, kayaking for long trips and long car rides and it always feels great afterwards. I’ve only had to recharge the battery twice in three weeks. While the units power settings go to 20, I’ve only been able to get it up to 10 or 11 at the most but having 12 different pulse patterns is nice for different types of therapy. 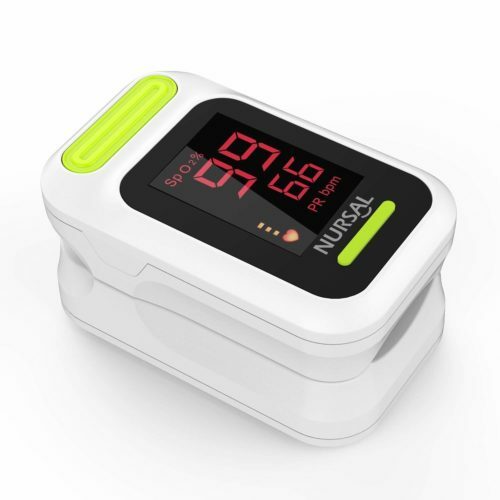 This little Tens unit is a powerhouse when used. Do not let its small size fool you, it is a very powerful unit. It comes with everything you need to help fight your pain and needs to relax. It pretty much has a mode for all of your needs and the Manual is very informative and useful. For the short money, you can not go wrong, I most highly recommend this product and the seller as well. Works really well. Battery lasts a long time. There are lots of “massage modalities” to choose from. Two functions I would have liked to have are 1) ability to channel A do one modality and channel B do a different modality simultaneously, and 2) have the two channels firing off at different times. Otherwise, I’m very satisfied and use it almost daily. Really helps with lower back pain. As far as I can tell the product works very well. I don’t have to use it all the time, but when I do it helps relieve the pain. I will continue to use it as long as I can and as long as it helps me. I bought this unit for my daughter. She has slight hip pain and this unit has done wonders to help her pain..
this is my 3rd tens unit but im getting them for friends and family too! Easy to use, portable, and helps my back pain!!! Love this. Helps my husband’s back and my neck. It’s great! Takes away the pain. It is my third purchase of the same Nursal massager. It functions great and battery lasts long. This is my first tens unit. If found that the unit was well made for the price. I’ve been experimenting with the modes to figure out what each one does. I found #7 to be my favorite so far. I wish there were more instructions to describe in detail what each mode does and what it was good for. I also wish you included some sort of acupuncture chart for placement of pads for various ailments and problems. Overall I’m happy with my purchase. Great product, great price. It works wonderfully on pain. Lifesaver for back and neck pain. Compact. Easy to Use. A friend lent me hers when I had a sever back spasm. It helped so much that I immediately went and bought one of my own and for a family member. Great product and great price. Highly recommend. Efficient little machine. Seller helpful and cooperative in providing product support. Highly recommend. I like the acupuncture setting the best. 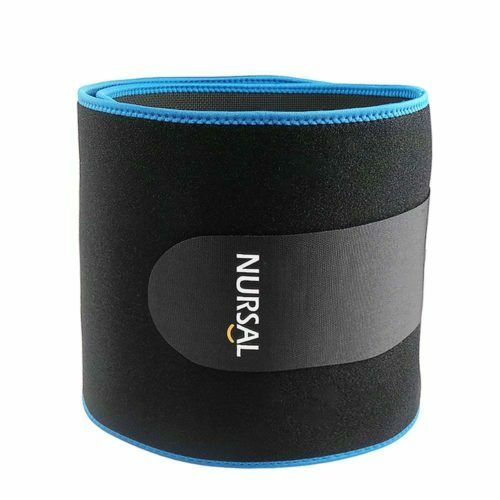 It seems to work the best to help relax muscle tension and release knots. Most of the other settings feel pretty similar though. The machine holds a charge well and goes a long time before needing to be recharged. Ordered this based on a friends recommendation. My husband has been suffering from “tennis elbow” related to computer work. 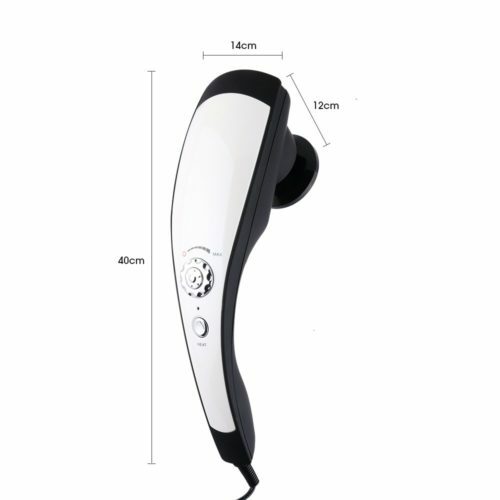 He raved about it from the first use – said “this feels so great on my arm.” He has been using daily for the last 7 days and it has provided him good relief. I’m also looking forward to trying as I get massive knots in my shoulders from stress. 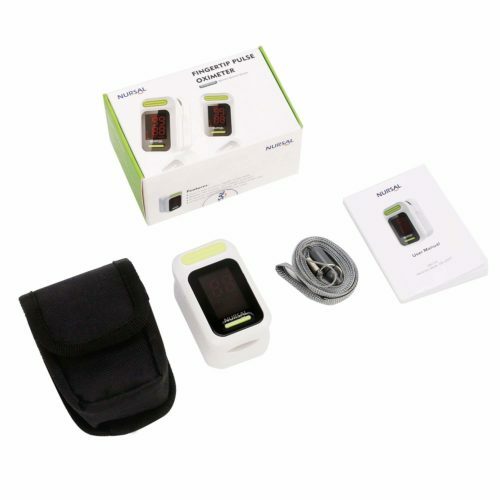 Highly recommend – an enormous value for the price and so compact Charges with a simple USB and has a variety of settings. I have used this Unit now for 4 months without problems for trigger points in my neck and upper back in conjunction with PT. It is easy to use and I can relax in my chair while using it, but it’s light enough that I can get up and see to something if I need to. Not as powerful as a professional model, but for the cost it feels great. I use this product to rescue spasticity from a stroke. It works well and has many vibration patterns. One VERY unique features is the ability to use different intensity levels on 2 different sets of leads at the same time. I can use one set on my forearm and another for my bicep at separate levels and have ideal intensity for both. Just a few dollars more than the cheapest options and way better than the 2 previous ones I have used. If I could take 1/4 of a point off I would. It comes with a short micro USB cable and no charger head . No biggie. Great TENS unit. I use it for any aches and pains. Faster and more effective than pain medication. My other one died and this is perfect and stronger. It works great and solves my problem.